Ahlam, a Redguard priestess, is a healer at the Temple of Kynareth in Whiterun. She is the wife of Nazeem, who owns Chillfurrow Farm. If Arcadia is killed, Ahlam will take over running Arcadia's Cauldron. The couple never sets foot on the farm, but are permanent residents of the Drunken Huntsman and Ahlam sleeps there every night between midnight and 9am. While her self-satisfied husband spends all of his time belittling the citizens of Whiterun, Ahlam uses her healing skills in the Temple of Kynareth from 9am to 9pm, interrupted only by a breath of fresh air near the Gildergreen tree between noon and 4pm. She spends her evenings in the upstairs area of the Huntsman, looking at her lazy husband while he sleeps. While her husband is obviously wealthy, Ahlam makes a more humble appearance and wears farm clothes and boots. She carries an iron dagger, along with a selection of common items and gold. She also carries the key to Wintersand Manor. Ahlam often loudly complains about her husband with remarks such as "Looking for my husband Nazeem? Check the Jarl's backside. That's usually where he stuffs himself these days." or "If you run into my husband Nazeem, remind him that he's not married to himself." She is quite hostile towards men, possibly due to her husband, and may sometimes speak out with remarks such as: "Men are all the same. From Hammerfell to Skyrim. All they care about is war and politics. And they treat their women like cattle." , or "Are you married? You look the type. Make sure you treat your wife with the respect she deserves." (but only if you are male). She will also state, "Here you stand, talking to a married woman. Why? Am I that interesting? Or perhaps there are other things on your mind." 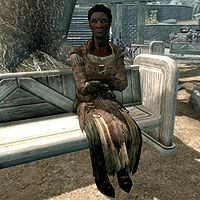 If Nazeem is dead, she expresses self-pity about her status as a widow with: "Here you stand, talking to a still grieving widow. Why? Am I that interesting? Or perhaps there are other things on your mind." "Are you alright, Ahlam? You haven't seemed yourself today." "What's wrong, dear friend? You seem... distracted today." Ahlam "Oh, it's Nazeem. He's been spending more and more time fawning over the Jarl. I swear, we're hardly ever home at the same time anymore." "It's nothing, I just... It's Nazeem. How did we get to this point, Danica? Is there no love left between us?" "Hmm? Oh, well... To be honest, I was just thinking of Nazeem. The gap between us seems to be widening. He is just so... self-absorbed." Danica "Now, now, my friend. You must look on the bright side. If soldiers storm the city, there's a good chance your husband may get killed." "If you don't mind me saying so, Ahlam, your husband is a damn fool. Any moment spent thinking about him is a moment wasted." "Ahlam, let's be honest. Your husband is an arrogant, domineering buffoon. These are the words you used to describe him to me... remember?" "Oh dearest, who cares? So your husband is a lout. The work you do here, with me, is invaluable. The people of Whiterun know your true worth." Ahlam "But it's more than that. Nazeem is obsessed with this civil war, as is all of Skyrim. I swear, it will consume us all." "Maybe Nazeem's obsession has merit. This civil war seems so big, so unceasing... I'm afraid, Danica. Afraid for us all." "Ha! Well, when you put it like that, it certainly puts things into perspective. But enough wallowing. And thank you, Danica." "Oh, you are terrible. You do know that, right? Ha ha ha ha ha." Ahlam carries the key to Wintersand Manor, but Wintersand Manor is nowhere to be found in Skyrim. This page was last modified on 1 April 2018, at 16:59.